Below are a few things to keep in mind when purchasing a used truck chassis for your volumetric mobile mixer. The first step is to determine a list of your must-have items. This will help you narrow down your search, as it may be overwhelming in the beginning of the process. It is also a good idea to take the serial number of the product you are interested in buying to the dealer, in order to confirm the basic specs. 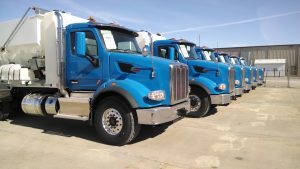 You will then need to determine if the truck meets or has the capability to meet all chassis requirements to fit the desired mixer body. Most the time an automatic or automated transmission could be the choice for almost every application, this provides many benefits ranging from maintenance items to safety to attracting new operators. Whether you ever the need to roll and pour concrete will determine what PTO configuration you may need. A different set-up may be needed for the particular transmission that may be in the used truck you decide to purchase. It is best to drive the truck and make sure the shifting is smooth, not missing shifts or grinding. Make sure you are choosing the right amount of horsepower and torque to take care of the job at hand. The terrain you will be operating in most frequently will also be an important factor in determining the engine specs. Also, you will need to look closely when popping the hood to look for signs of any leakage or seepage on the engine. Look for anything that does not seem right. Listen for knocking in the engine; if you do hear knocking, you will need to investigate further to determine the problem. If the truck is a 2008 or newer it is very important to make sure all emission components are in place and working properly. Look at your weights you will be carrying to make sure you have the correct capacity to handle the load. Also, you will need to confirm with your state and federal laws to determine the axle set-up for your unit. This will prevent any trouble in the future, as well as extend the life of your chassis. Be sure to inspect the inside and outside of the cab. Check the overall wear on the seats and dash. It’s always a good thing at this point to see if the air conditioner is blowing cool and the heater is warming. Check for rust on both the cab and the frame. You will need to look at the amount of miles on the truck, but more importantly confirm the amount of hours. A general rule of thumb: for every hour logged, multiply by 45 to determine the true miles of the unit. It is imperative to check the brakes. Brakes are a fairly inexpensive item to replace, but safety for you and your team is the most important. More times than not, you will have a good or bad feeling about the unit you are purchasing. Be sure to do all of your proper checks and don’t cut any corners. As long as you do this, you will find a truck that will make you money – not cost you money!! Want to know more about how to fit a used chassis to a new or used mobile mixer? Call 800.247.2464 or submit a Contact Us form.